As 2009 left and 2010 came rushing in, we thought we would take a look back at the past year here at CFC... albeit a bit late. 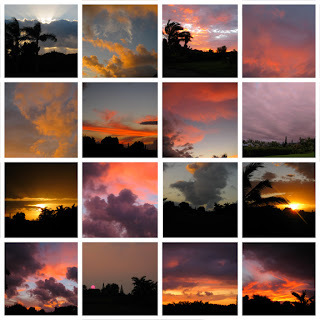 Mahalo to everyone who stopped by and found what we had to say from Haiku, Maui entertaining, informative, funny or just plain stupid over the last 3 years. We look forward to sharing more of our adventures soon and hearing what you have to say... so stay tuned. We still have a few projects up our short sleeves that involve the completion of the office and the building of a new garden/tractor shed. Oh yeah... and we can't wait to get our garden up and growing again. Aloha + Hau’oli Makahiki Hou! It was a slow month in terms of activities... but we had a good amount of work to keep us busy in January. We did take time to take a hike down to the ocean cliffs, enjoyed daily visits from Kekoa and made a few treats with the winter guava. February was another one of those slow months in terms of activities and heavy on work. John made his way to Oahu for a meeting with Leonard's Bakery, a bit of whale watching, more visits from Kekoa and gardening. All work and no play... ok... some play, but not much. 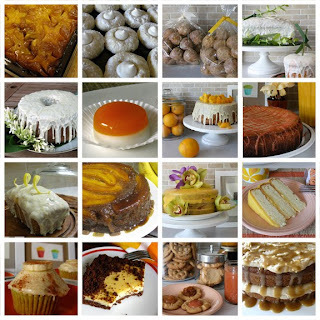 This month we finally tried the banana fruit pies at McDonald's, had Kekoa eating out of our hands, planted a few new hedges and John found himself back on Oahu photographing ALL the baked goods Leonard's Bakery has to offer for their website. That giant shopping bag full of sweet treats he brought home didn't last long. Sam Sato's, Lahaina, the beach and home for dessert on John's birthday. A few days later Kekoa showed up with his broken leg. The 2 weeks of nursing back to health, with no eating and loud crowing at 5:00 AM was taking it's toll on all of us. After a few days of weaning in the coop, we finally let him go, only to find out he was harassing a neighbor, who admitted to kicking him, so we felt it best to take him somewhere a bit safer. That's when we met Laurlee at Leilani Farm Sanctuary. With heavy hearts, we dropped Kekoa off at her farm in hopes he might have a better chance at not being hurt. We are not really sure what became of him, but Laurelee said she hears him crowing now and then. We started the demo on the shed in preparation for the new office. New gas lines were dug and we stopped by Leilani Farm Sanctuary to help plant fruit tree's for the animals to feast on with the help of Orchards for Animals. We did not see Kekoa, bu we did hear him. May was another jam packed month. Without Kekoa around, it was feeling a bit dreary. His dad, Big Daddy as we call him, began making regular visits to the banana patch... where I put out grains for him and the other birds. We also discovered the Northern Cardinal nest and kept an eye on that daily. The lanai became the temporary home for our water pump, pressure tanks and batteries. 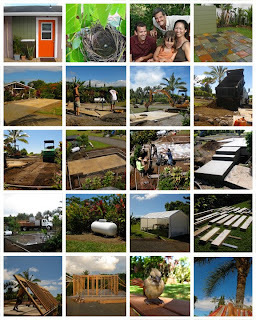 Solar panels were relocated to the lawn and new underground power lines were laid to the battery box. Another trip to McDonald's, this time for the Taro pie... the best one in my opinion. More demolition of the shed on top of all our design work. 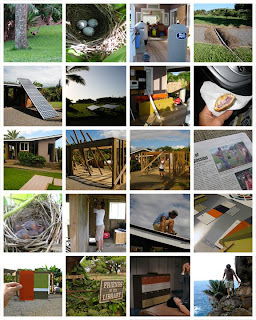 We manged to get our photo's in Maui Weekly from the tree planting at the sanctuary and saw the 3 baby cardinals hatch. More demolition and selections of exterior paint colors and desk tops were tackled. We finally made it to the MFOL - Maui Friend's of the Library and are now addicted. We participated in an interview over at the groovy paige + modern on what influences us. The month ended with a Memorial Day hike along the sea cliffs. Summer is here and we didn't even notice spring. 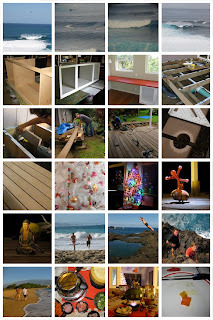 We thank our lucky stars we had so much design work this year. Here's hoping it keeps up now that we have a proper office. Exterior paint colors were finalized, the baby cardinals flew the coop. We finally got to meet Deb, Scott and Malia from Deb and her Camera fame. That was a treat... why don't you still live here Deb? WHY? Tiles for the lanai were finalized... stay tuned for the installation of those in the next month. Excavation was done and concrete was poured for the new office. Building materials arrived as did a new propane tank. The work tent was erected, wood was cut and walls were raised. A teenage cardinal needed special handling after it flew into the house and was knocked out cold. Nursing an injured bird was not on my to do list. He sure was cute and I still can't believe I held a baby cardinal... John immediately looked at me and said ... NO. After long hot days of building and computer work... a rest in the hammocks was in order. Keep it coming. Summer seemed to be flying by. The second story was put on, the roof was attached and inspections were coming at us left and right. Windows FINALLY arrived and we could get back to building. Siding was attached and painted. 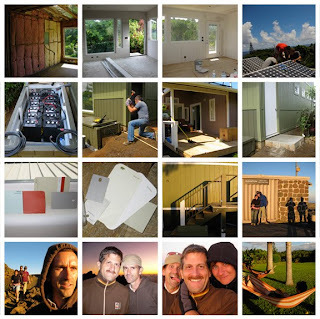 The metal roof was secured, more painting was done as well as more and more design work. Big Daddy was still hanging out and finally realizing that I was the source of the grain. He is used to me know and does not run off to quickly. He hides just on the other side of the drive and as soon as I walk away from the pile of grain... here he comes. It was time to do a bit of shopping and find things for the interior like this perfect 3-drawer orange chest of drawers. AH.. a moment to breath... the desks tops and bathroom counters arrived, the stair rails were installed and we got to we try the coconut pie at McD's. 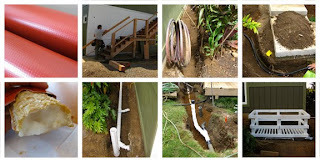 Drain pipes and water lines buried as well as the construction of the new battery box. 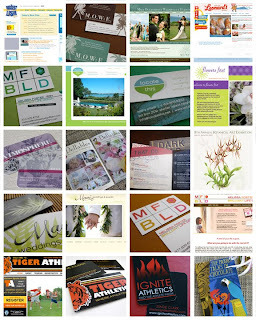 Oh... did I mention we had lot's of design work this month? That explains the lack of imagery this month. I'M NOT COMPLAINING!... just sayin'. Back at it and full throttle. Insulation in place, sheet rock hung and walls plastered. Solar panels placed on the roof and batteries on their new home. The water pump and pressure tank were also relocated to the new utility room which also received it's new concrete landing. Interior paint colors were chosen, then we later tossed out the Vintage Map Blue color. The copper rails were cut, polished and installed on the stairs. And we ended the month with a visit from John's high school chum Denise and her husband. Boy did we need a mini vacation? Banisters and copper rails were finished and a pathway of stepping stones was put in place. Walls were painted and lighting installed. I worked on staining the concrete floor... a 3 day project, while John installed the Crushed Mulberry upstairs. We had a wayward Homing Pigeon we named Homie, call our lanai home for about 2 weeks and we FINALLY got the Hawaii Volcanoes National Park poster by artist Charley Harper framed as a birthday present to myself. It's still waiting to be hung. November saw us getting our FINAL INSPECTION and we found ourselves taking a few days off to regroup. It was then that we really noticed just how much we had ignored the yard and garden. So what did we do? 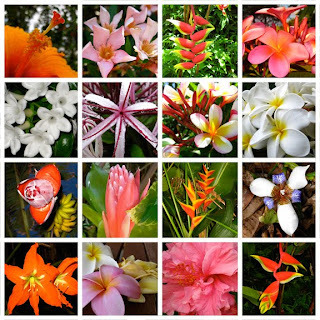 We went the the Arbor Day Celebration at Maui Nui Botanical Gardens and picked up a few more plants and planted a small succulent garden with some of our finds. John and I were invited by Anne over at one of our favorite "getaways" - Prêt à Voyager - to participate in an interview segment called Boarding Pass. Read Conn's interview here. More shopping and a few great vintage finds like these little coffee cups from Japan. Thanks giving came and went and I finally just pulled the car over at the side of the road on the way to town one day, parked it, got out and walked along a rocky shore and cliffs that I had never stopped at before. Sometimes you just gotta slow down and enjoy the things around you. I can't wait to go back with John's folks and my family in the next few months. December brought us HUGE 40-50 foot waves at JAWS and there was no way I was missing them. We had a front row seat on the cliffs at JAWS here on Maui's North Shore to some of the best names in surfing. How can you say no to that? John began building the cabinets for under the desk and we got the top set in place. So far so good. Next up we ripped out the old lanai and installed the new composite decking... more on that in a future post. We no sooner got the last screw in and our friend William from NYC arrived for 2 weeks... which meant we were on another mini vacation. The tree was decorated with much thanks to Denise and Peter for the new LED lights on white cords and parties were attended. 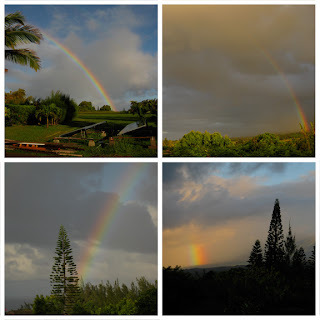 Swimming, hiking and resting were on the agenda as well as a drive to Hana and Kaupo in a convertible. It was great to have the top down... but the back seat is REALLY where you want to be for the best views. The year ended with a night of fondu and a chocolate version for dessert and a little bubbly. Just the 3 of us and we were all lights out by 11:30 PM. It was already midnight somewhere... right? And if we could grow it, we ate it. 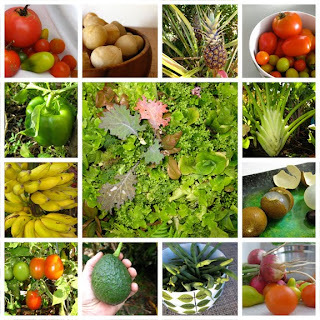 Tomatoes, mac nuts, pineapple, more tomatoes, peppers, lettuce, fennel, bananas, more tomatoes, avocado, green and lima beans and radishes. And did I mention tomatoes? starfruit upside down cake, lemon cookies, lilikoi and banana doughnuts, citrus pound cake, lilikoi coconut jello, orange chocolate pound cake, guava cheesecake, lemon pepper pound cake, banana upside down cake, lilikoi cream cheese cake, banana honey cupcakes, orange chocolate cheesecake, peanut butter and jelly cookies and guava caramel cake... just to name a few. With a schedule that was truly evil... we did not cook as much as we would have liked to... but we got by. 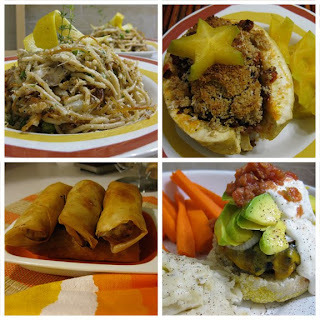 Turkey tetrazzini, stuffed breadfruit, lumpia and southwestern hamburgers were just a few home cooked meals on the menu. 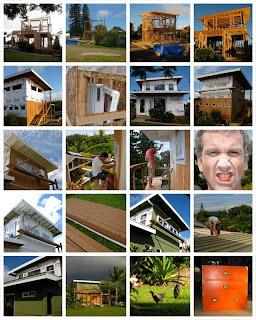 ...Some of our design work this last year. ...with more in the works, so stay tuned for new designs and launches this spring. 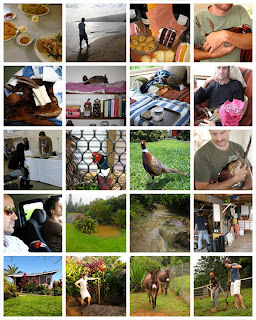 Please visit us often in 2010 for the more Adventures of Conn + John in Haiku, Maui. We will have some updates and final postings on the new office as well as some new posts on the garden shed and another all new project I hope to get off the ground this year. And who knows what critter we will be showing off next. To those of you who visited... we loved hearing from you and hope you enjoyed your visits. We hope to hear from you again soon. WHY????? i ask myself that once daily, twice in the winter;) we'll just have to pack double the fun in next trip! what a YEAR. looks like a perfect mix of work and play . . .and food. i'm so happy we shared just a little part of it with you. I got my own mention line! Thanks! @deb: looking forward to double the fun next time around. @anonymous: mahalo. glad we can give you a little "view" of home now and then. AMAZING!! Keep up the great work guys! So much beautiful and yum! I look forward to reading of your ongoing adventures in paradise. Your blog is constantly interesting. An amazing year! 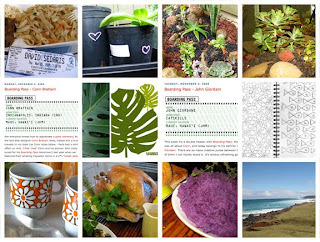 Mahalo for sharing helpful tips, recipes, photos and wonderful stories. You two are inspiring. It's always a good day when I see a new post. My name is Victoria Long I was browsing internet and found your blog. The author did a great job. I will subscribe to your RSS feeds. Thank you for your contribution. I am a web designer myself. And here some examples of the websites that I designed for canadian payday loans online payday loan company.